In this paper we use a case study of the Rhine River to examine the relevance of Common Pool Resource (CPR) Theory for two conditions in which it has not been extensively tested: large scale international water management and pollution problems. For that purpose, we link variation in pollution abatement to a set of explanatory variables proposed by CPR theory. Causal inference is established through process tracing and a series of within-case comparison across actor groups (i.e. riparian nations, industry, and agriculture), resource types (i.e. point source, and non-point source pollutants), and time periods (1976–1986, when treaties provided a limited basis for collective action and pollution abatement, and 1987–2001, when the Rhine Action Plan proved more successful). According to our analysis, a number of CPR variables can help understanding cooperation for pollution abatement in the Rhine case. These include physical attributes such as clear hydrological boundaries; governance factors such as the articulation of monitoring and decision-making at different governance levels and the proportional allocation of costs and benefits of abating pollution; and actor factors like the small size, trust and homogeneity of some actor groups and leadership. Other variables proposed by CPR theory proved to be irrelevant or in need of qualification. These include the right to self-organize and to participate in decision-making, communication and resource-dependence. Finally, two variables, not emphasized by CPR theory, proved relevant: the occurrence of external disturbances and the role of interest groups. We conclude that CPR theory is valuable for explaining pollution management in large trans-boundary river basins, but requires qualification and extension. In this paper we present a case study of water governance in the Rhine River in order to examine the relevance of Common Pool Resource (CPR) theory for two contexts where the theory has not been extensively tested before: large scale trans-boundary water management and water pollution. Applications of CPR theory to the study of water governance have traditionally focused on identifying the conditions under which individuals are able to cooperate at the local level. In this vein, CPR theory has traditionally understood cooperation as fundamentally mediated by the ability of relatively small and homogeneous communities of users to communicate frequently and design appropriate rules and norms of behavior (Agrawal 2001). Large, trans-boundary systems differ from that ideal scenario in a number of ways. Such systems involve a huge number and diversity of stakeholders, are too large for coordination through frequent interactions, and tend to lack the sort of pre-existing political and social institutions relied on at smaller scales. In this paper we explore the extent to which these differences hinder the applicability of CPR theory. Many rivers also face severe pollution problems that require additional exploration (UNEP et al. 2008). In this paper we aim to contribute to that understanding by applying CPR theory to the case of the Rhine River. A number of studies agree on the success of pollution management in the Rhine (van Dijk et al. 1995; Bernauer and Moser 1996; Dieperink 2000; Huisman et al. 2000; Froehlich-Schmitt 2003). At the beginning of the 1960s, water quality in the Rhine watershed had reached its poorest state. The lower portions of the river contained high concentrations of pollutants such as lead, mercury, cadmium and zinc, while a number of fish species like salmon had been completely eliminated from the watershed, and the aquatic ecosystem was virtually dead (Nollkaemper 1996). Until that time, international cooperation on the river had been limited to the regulation of shipping and salmon fishing, and more localized agreements concerning Lake Constance, and tributaries such as the Saar and Moselle. This changed with the creation of the International Commission for the Protection of the Rhine (ICPR) in the 1960s and a series of pollution management agreements in the 1970s and 1980s. Most of the states that cooperated to create the ICPR belonged to the European Economic Community, which had been founded only in 1951. Since then, pollution regulations issued by the ICPR and the European Union developed in parallel. By the mid-1990s, emissions of two-thirds of critical chemicals had been reduced by 50%, water quality parameters had improved notably, and salmon and other fish stocks were on their way to recovery (ICPR 2012a). The success of the Rhine case is not absolute. Environmental outcomes have improved only over time and the governance system seems to have been more effective with regard to point-source than to non-point-source pollutants and polluters. Offering a consistent explanation for that variation in performance constitutes the main theoretical goal of this paper. Can CPR theory help us to understand the relative success of water pollution management in the Rhine watershed? And, to what extent can CPR theory be applied to pollution problems in similar large, trans-boundary contexts? 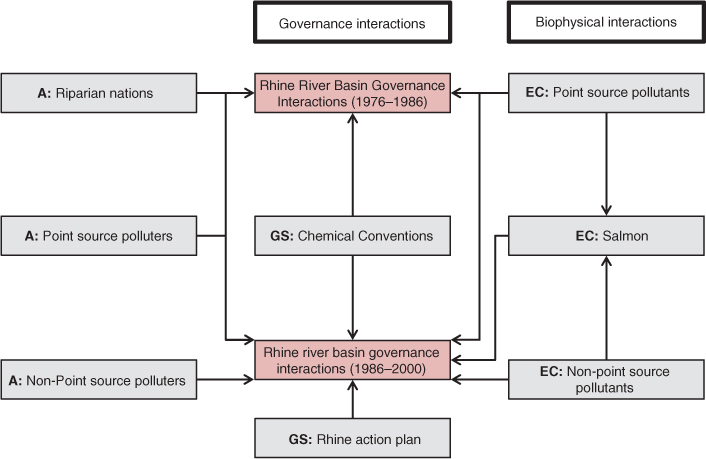 To answer these questions we characterize the Rhine case across a series of governance, actor and biophysical variables. Our case selection is appropriate as a test for CPR theory for several reasons. First, the Rhine is the largest watershed in north-western Europe, covering 170,000 km2 and a population of about 60 million people across eight different countries. Additionally, the historical density of industrial and agricultural activity has been among the highest in the world (Stigliani et al. 1993). Second, the long history of conflict between the countries of the Rhine basin makes it a particularly unlikely case for successful international cooperation. Third, the success of pollution management in the Rhine is only partial. Initial successes emerged only in the late 1970s, after more than a decade of missteps. Moreover, there are still important pollution control gaps, particularly with regard to non-point source emissions (Froehlich-Schmitt 2003). This within-case variation facilitates the identification of factors that contribute to success as well as prevent it. Finally, the case has been studied by a large number of scholars which provides us an opportunity to develop a thorough comparison of the case with CPR theory by drawing on existing studies. The core presumption of CPR theory is that certain environmental problems result from collective action problems, in which actors must overcome incentives geared at short-term individual gains to achieve socially preferred outcomes (Ostrom et al. 1994). CPR theory distinguishes two types of collective action problems: appropriation and provision problems (Ostrom et al. 1994). A provision problem emerges when the costs of providing a public good are private while the benefits are shared. The difficulty of excluding individuals from using public goods constitutes an incentive for individuals not to contribute to their provision. This may result in the under-provision of the goods. A common provision problem in the water sector is underinvestment in infrastructure such as reservoirs or canals. Appropriation problems emerge when benefits from harvesting resource units are private while costs are shared. These problems are associated with common pool resources (CPRs), which share with public goods the difficulty of excluding users and thus the risk of under-provision. In addition, CPRs are depleted when used, which can result in negative externalities and over-exploitation if individual demand is high enough. The combination of difficult excludability and rivalry in consumption constitutes an incentive for individuals not to restrain their harvesting behavior even if that would be needed. Over-irrigation by farmers in semi-arid contexts is a typical example of a water appropriation problem. Emitting pollutants can be compared to over-appropriating from a CPR. Like in appropriation problems, the benefits of over-emitting polluting substances are private to polluters while the costs are shared by a broader population. However, appropriating a CPR and emitting a pollutant involve different dynamics. In the former case, the collective action problem is related to the use and exhaustibility of the CPR (e.g. farmers using water from a river). In the latter case, the collective action problem is due to the negative impact of the pollutant (e.g. cadmium) on the quantity and/or quality of a related CPR or public good (e.g. salmon stocks or drinking water). Thus, in pollution situations, the collective action problem can also be understood as a problem of natural resource restoration (i.e. comparable to public good provision).1 Additionally, in pollution contexts the interaction between actors and the environmental commons can be particularly distant. Contrary to appropriation problems, where all users jointly use (i.e. depend on) a common good, in pollution problems, the actors producing the externality may well not depend on the affected good, nor even share its use. Chemical firms polluting a river do not usually depend on high-quality water for their productive activities, as farmers or fishers do. Also importantly, the pollution externality can well be mediated through the interactions between environmental commons, like polluted water and aquatic species, which is not the case in conventional CPR appropriation problems. A number of scholars have successfully applied CPR theory to understand water allocation and infrastructure provision in larger river basins (Blomquist et al. 2004, 2005; Kerr 2007; Schlager and Blomquist 2008; Heikkila et al. 2011; Schlager and Heikkila 2011; Heikkila and Schlager 2012; Yetim 2002). For example, CPR theory is applied to US interstate river compacts by Schlager and Blomquist (2008) and Heikkila and Schlager (2012) focus on cross-scale institutional linkages to assess the performance and climate change adaptability of US interstate river compacts, respectively; Yetim (2002) emphasizes the importance of clear property rights and enforcement mechanisms to solve International Common Pool Resources disputes; Blomquist et al. (2005) and Kerr (2007) identified a number of factors of CPR theory related with successful river basin management, including, among others, leadership, the recognition of sub-basin authorities and nesting of organizational capacities and collective choice across scales. As illustrated by those works, using CPR theory in large scale contexts entails a redefinition of concepts like user group and governance system, as well as the consideration of phenomena other than collective action problems (for example the existence of contentious politics). In this regard, some authors have pointed to the lack of interest of applying CPR theory to large scale contexts. Araral (2014) acknowledges that the management of local and large commons can be confronted by similar appropriation and provision dilemmas, but that the differences in scale, transaction costs, and the nature of the actor groups (individuals vs. nation-states) results in qualitatively different cooperation dynamics. At lager scales “the main actors are nation-states represented by a collection of political actors who are trying to maximize their constituencies’ self-interests to secure their own political survival” (Araral 2014, 9); and this results in wicked interactions not observed at local levels. Other differences pointed to by authors include actor’s awareness of degradation, power, cultural and institutional homogeneity, feasibility of learning, regeneration of degraded resource, ease of understanding resource dynamics and stability of resource dynamics (Keohane and Ostrom 1995; Stern 2011). A number of studies have also applied CPR theory to water pollution problems. Some of those studies focus on the collective action problems faced by specific user groups to effectively reduce pollution (Lundqvist 2001; Wittgren et al. 2005; Amblard 2012). Other studies aim at identifying the factors that motivate polluters to reduce emissions or invest in water quality (Lo and Tang 1994; Lundqvist 2001; Emery and Franks 2012), including trust and reciprocity (Lundqvist 2001), the diversification of decision-making authority (Lo and Tang 1994) and common understanding and horizons among polluters (Emery and Franks 2012). In this study we aim at understanding both phenomena simultaneously. Since the 19th Century the Rhine (Figure 1) has been intensively used for shipping, irrigation, drinking water production, fishing and industrial waste disposal, thereby becoming one of the underpinnings of the economy of Western Europe. The resulting benefits came with a price. By the beginning of the 20th Century the impact of waste disposal and other forms of pollution on drinking water, irrigation and fishing raised a concern about the need to cooperate to control emissions. The history of international cooperation on the Rhine has been extensively documented (Dieperink 1998 , 2000; Huisman et al. 2000; Bernauer 2002; Mostert 2009). A summary of major events is provided in Table 1. The earliest international cooperation on the Rhine began at the end of the Napoleonic wars, with agreements on trade. Concern over overfishing of salmon led to the creation of the Salmon Commission in 1885. This Commission, however, did not prevent the construction of dams and water works, which had a negative impact on migratory fish species. By 1940 salmon stocks were depleted. The Dutch brought the pollution issue to the Salmon Commission as early as the 1920s (Huisman et al. 2000). Despite the Dutch efforts, steps to create a common pollution information system began only in the 1950s. Ultimately, the Berne Convention was signed in 1963 which resulted in the creation of the ICPR. Progress following the creation of the ICPR remained slow for the next decade due to conflicts between the Dutch, who bore most of the cost of pollution, and France and Germany, where most of the polluting industries were located. In 1976 a series of deals were reached resulting in the Convention on the Protection of the Rhine against Pollution by Chlorides (Chlorides Convention) and the Convention for the Protection of the Rhine against Chemical Pollution (Chemical Convention). The lengthy procedure to decide which chemicals to regulate slowed down the implementation process of the Chemical Convention. Ratification of the Chlorides Convention took even longer. In the meantime, frustrated Dutch gardeners, environmental groups, and water companies sued the French potassium mines and other polluters, and reached private settlements. The disastrous chemical spill at Sandoz, Basel (Switzerland) in 1986 was widely considered a turning point in attempts to clean up the Rhine. A special minister’s conference was called a few weeks after the disaster, where the Dutch minister proposed an international agreement for improving the health of the ecosystem as a whole. The reintroduction of the salmon in the river and the control of non-point source pollution were two of the new goals of that effort (IKSR 1987; Bernauer and Moser 1996). 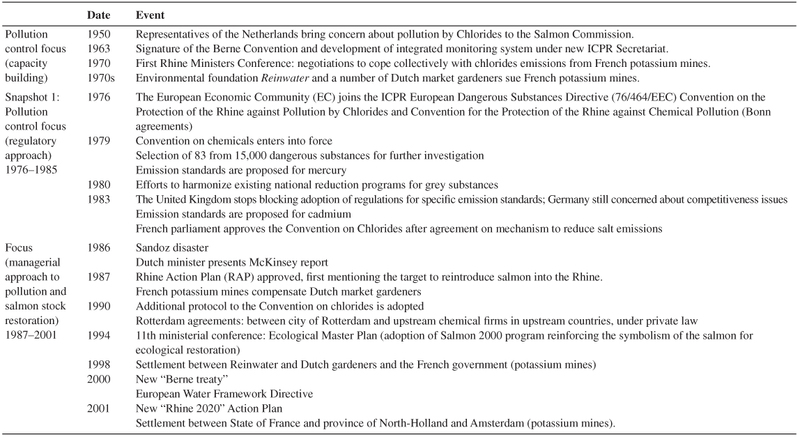 This proposal became the basis for a Rhine Action Plan (RAP), which was adopted by ICPR members in 1987. The first edition of the RAP (1987–2000) was relatively successful. A crucial aspect of that success was continuing threats from the Dutch government and private parties to claim compensation for damages from upstream polluters, as well as Dutch flexibility to adopt innovative measures to clean up or facilitate the discharge of pollutants, and to give financial aid to upstream polluters for their mitigation activities. Subsequent agreements have built on the successes of the RAP, including additions to the Chlorides Convention, new goals for salmon restoration, further agreements between downstream and upstream users, and the renegotiation of the Berne treaty and the RAP (ICPR 1994; Frijters and Leentvaar 2003; Mostert 2009). This study was developed as part of the larger Social-Ecological Systems Metanalysis Database (SESMAD) project which analyses data on a series of physical, actor and governance factors that can be related to sustainable management of environmental commons (Cox 2014). The SESMAD database is a relational database containing approximately 200 variables relevant for the study of Social Ecological Systems (SES). The variables are stored in three tables. The case table contains general information about the SES, which is defined as a system containing at least one, but often more, of the following components: an environmental commons, a governance system, and an actor group. An environmental commons (EC) is an environmental resource or pollutant that can be subjected to human use, production, and governance. An actor group (A) can be comprised of individuals, organizations, or nations that have developed a set of institutional arrangements in order to manage human interactions in a specific environmental system, or who alter resource characteristics through extraction or emission. A governance system (GS) is a set of institutional arrangements (such as rules, policies, and governance activities) that affect interaction between one or more actor groups and an environmental commons (EC). The component table records attributes of each of the above components. Interactions between these components are stored as records in the interactions (I) table. There are two main types of interactions: interactions between one or more actor groups and an environmental commons, as mediated by one or more governance systems; and interactions between two or more environmental commons. The tables can be also used to enter information about different temporal “snapshots” of the case, facilitating the identification of changes in the components, attributes and interactions over time. Not all the variables included in the SESMAD database are relevant to test CPR theory. In this paper we focus on an initial selection of those that have consistently been mentioned by CPR scholars as contributing to sustainable management. For that purpose we rely on Agrawal (2001) and Poteete et al. (2010), two comprehensive syntheses of CPR theory. Additionally, we assessed the case with regard to the rest of variables contained in the SESMAD to explore the relevance of other factors not emphasized by the theory. Case studies of complex phenomena like pollution in the Rhine face a problem of indiscriminate pluralism, i.e. the identification of causal relationships where multiple conditions seem to be contributing to an outcome and there are not enough counterfactuals to clarify which of them are more important and under which conditions (Steinberg 2007).3 To minimize that issue, we relied on three strategies. First, we tested predictions made by CPR theory for the case of pollution management and resource restoration in the Rhine. For example, CPR theory tells us that the presence of sanctioning mechanisms will contribute to cooperation and the effectiveness of governance measures aiming at improving environmental outcomes. Thus, given the relative success of the Rhine governance system, we expected that sanctioning mechanisms were present. Second, we conducted a series of within-case comparisons to explain variation in environmental outcomes over time and across types of pollutants (George and Bennett 2005). Changes in governance characteristics over time were assessed against changes in pollution concentrations. Similarly, the degree of presence or absence of actor characteristics like heterogeneity, boundaries or size were compared across industrial and agricultural actor groups and evaluated against pollution concentration levels of point and non-point source pollutants, respectively. The development of a table highlighting relevant variables across those components was instrumental in the analysis (see Section 5.3). A third within-case comparison distinguishing upstream vs. downstream riparian nations was also used to understand the dynamics of institutional development and change. Third, we used process tracing complementarily to within-case comparisons. Process tracing is a within-case inductive technique that lays out, usually in a linear fashion, the course of events that connect a cause and an effect (George and Bennett 2005; Collier 2011). The technique requires the disaggregation of a phenomenon into smaller pieces, or events, some of which occur at different points in time (Steinberg 2007), and their connection through a causal argument. Specifically, process tracing was useful to link the creation of the ICPR governance system to the improvement of point-source chemical pollution in the 1970s. This was carried by paying attention to, the development of a strong environmental monitoring network coordinated by the ICPR, the increasing watchdog role carried by interest groups and public awareness of the pollution problem, and the pro-compliant behavior of industrial polluters to abate chemical emissions. Similarly, process tracing became handy to link the occurrence of the Sandoz disaster and the qualitative leap in the protection of the Rhine. In that process we focused on the role of the Dutch leadership, the approval of the RAP and the collaborative turn in the approach to pollution abatement. Our process tracing exercise draws primarily on the process tracing conducted by the authors we reviewed, which we have reproduced to the extent possible. Also, we structure the paper findings across four general processes that help to understand the contribution of the variables under study to the relative success of the Rhine case. Figure 2 shows the structure of the case. First, we distinguish three types of environmental commons: point-source pollutants like Cadmium or Zinc, non-point source pollutants like nitrogen and phosphorous, and natural resources like salmon. Second, we identify one governance system and two relevant governance periods. One period goes from 1976 to 1986 and corresponds to the approval and initial implementation of the Chemicals Convention, and the second goes from 1986 to 2000 and corresponds to the adoption and implementation of the first edition of the RAP. As shown in the Figure, one difference between these two governance periods is the interest of the RAP in managing non-point source pollutants and natural resources in addition to the focus on point source pollution control. This is not the only difference, however, as will be further explained in the following section. Finally, we identify three clusters of actor groups: the riparian nations, industrial users, and agricultural users. The point of departure of our analysis is a review of concentrations of point and non-point source pollutants and oxygen in the Rhine across the two periods under analysis. Heavy metals like Cadmium and Zinc are used here as an indicator of broader patterns in point-source pollution. Although there are diffuse sources of Cadmium and Zinc, most emissions in the 1970s came from point-sources (Stigliani et al. 1993). As Figure 3 illustrates, there was a clear decrease of concentration levels since the second half of the 1970s, (see particularly the trend for Cadmium). As a matter of fact, the emission of many chemical pollutant were reduced between 80% and 90% during that decade (Verweij 2000). By the beginning of the 1980s, the trend became much less clear; and it is not until the second half of the 1980s when we find a new inflexion point (see particularly Zinc in Figure 3). Indeed, between 1988 and 2000 Rhine companies again accomplished an 80% to 90% reduction in levels of many chemical pollutants in their wastewater discharges (Verweij 2000). That said, the levels of some heavy metals in suspended matter of the Rhine were still high at the beginning of the 2000s, as a result of long residence times (Froehlich-Schmitt 2003). Oxygen levels are treated as a proxy for ecosystem health. In this case, the increasing trend is an indicator of the overall success of the governance regime (Figure 3). Another indicator of the ecological conditions of the Rhine is salmon. Salmon are a good proxy for a number of ecosystem services provided by the Rhine because salmon require clean water, naturally connected river basins, and an abundance and diversity of aquatic invertebrates. Over-fishing, channelization and damming in the late 19th and early 20th centuries reduced salmon stocks tremendously. The subsequent decline in water quality contributed to the extinction of salmon stocks by the 1940s (De Groot 1992, 2002; Nienhuis et al. 2002). The progressive improvement of oxygen levels since at least the 1970s facilitated the implementation of the RAP’s goal of restoring salmon stocks from the mid-1980s on. From the 1950s to 1989 six salmon were caught in the entire Rhine watershed, and between 1989 and 1992, the number increased to 18 (van Dijk et al. 1995). Salmon stocks continued to improve in subsequent years thanks also to an active policy to restore the natural river bed of the Rhine (Froehlich-Schmitt 2003). According to our analysis, a number of factors help to understand the performance of the governance system vis à vis point and non-point source pollutants over time. Specifically, we find that 14 factors can be associated with the outcomes of the case (Table 2). Their hypothesized effect on pollution abatement can be summarized in four overarching processes contributing to cooperation: linking environmental information to polluter behavior, self-organizing, brokering cooperation, and guaranteeing rule compliance. We structure the presentation of our results along these lines. The ability of the ICPR to affect pollution patterns depended to a great extent on its ability to link environmental information to polluter behavior. We associate this observation to two variables which are emphasized in CPR theory: the existence of strong environmental monitoring systems and the clarity of the underlying biophysical boundaries of the system. According to CPR theory, information fosters transparency and thus cooperation among users (Ostrom et al. 1994). Also, environmental monitoring permits the assessment and adjustment of management measures to changing local conditions (Cox et al. 2010). In the case of the Rhine, environmental monitoring allowed for the emergence of a close-knit scientific community and an advanced understanding of the dynamics and potential solutions to the pollution problem, which was fundamental to assign pollution abatement responsibilities among polluters (Bernauer and Moser 1996; Raadgever 2005). The environmental monitoring network in the Rhine is strong in large part because it has a long history and is based on diverse institutions. One of the main accomplishments of the Berne Convention was gathering and publishing information about concentrations of pollutants in the watershed (Bernauer and Moser 1996). In the 1970s, the International Commission for the Hydrology of the Rhine Basin (CHR) was created to strengthen data exchange and standardize measuring methods. The Chlorides and Chemicals conventions signed in the mid-70s led to the consolidation of a network of measuring stations that enabled an assessment of the influence of upstream polluters within the Rhine and its main tributaries on pollution concentrations (Huisman et al. 2000). The increased availability of information and its centralization in the ICPR facilitated the watchdog role played by downstream interest groups and nations and an increasing public awareness of pollution activities by the chemical industry. The court cases of the Dutch market gardeners and Reinwater against the French potassium mines in the early 1970s – some of which were apparently only settled in the beginning of the last decade – are paradigmatic in that regard but not the only evidence. Already in the 1960s, the Rhine’s Waterworks Commission (RIWA), one of the most active interest groups against pollution in the Rhine, had manifested an interest in improving the usability of the ICPRs monitoring system by requesting an enlargement of the pollutants being surveyed (Gurtner-Zimmermann 1998; Disco 2007). Ultimately, the awareness raising actions of interest groups like the RIWA and others created an image of “sick river in Europe” that set the path for the chemical industry to adopt a pro-active role in pollution control (Nollkaemper 1990; Bernauer and Moser 1996; Verweij 2000; Disco 2007; Mostert 2009). “Even notorious polluters like the huge chemical firm BASF in Ludwigshafen invested capital amounts in new (and well-publicised) wastewater treatment plants and, very gradually, a number of indicators of pollution began to show a downward trend for the first time in nearly 100 years of measurements” (Disco 2007). With the RAP, monitoring efforts expanded from the assessment of ambient concentrations to the supervision of emissions by industrial firms. Over the years, the monitoring program increased the frequency of sampling, the number of parameters measured, as well as the speed of diagnosis and information diffusion in case of major spills or other disasters. This emphasized the need to improve the governance of non-point source pollutants like nitrogen, which currently constitutes one of the main concerns of the ICPR (ICPR 2012e,f). The development of the monitoring network was facilitated by the relatively clear boundaries of the Rhine’s hydrological system and its fit with the boundaries of the governance system. Although the hydrological system includes both surface and underground waters, the latter are confined to well understood regional aquifers (Uehlinger et al. 2009). In addition, a series of ‘corrections’ to the river bed for flood-protection and agricultural production (i.e. dams and river channels) over the 19th and 20th Centuries further delimited the boundaries of the river and its connectivity to the rest of the hydrological system (Wieriks and Schulte-Wülwer-Leidig 2009). Finally, the system is almost entirely confined within the borders of the ICPR nation states (see Figure 1). The Rhine’s governance system emerged and has evolved as a multi-level enterprise of self-organized actor groups like the riparian nations and the industrial polluters. According to CPR theory, the nesting of self-organized enterprises at multiple levels of governance levels aids collective action by splitting ventures among a large number of actors into smaller enterprises with reduced transaction costs (Ostrom 1990; Lam 2006; Cox et al. 2010). Also, “nesting a set of local institutions into a network of medium- to larger-scale institutions helps ensure that larger-scale problems are addressed as well as those that are smaller” (Anderies et al. 2004). This is particularly clear with regard to the group of riparian nations. Individual resource users are nested within a small number of nation states that engage in collective decision-making and bargaining. This avoids the need for coordination between a huge number of players, which would have led to prohibitive transaction costs. An example is the basin-wide environmental monitoring system which relies on the measuring and reporting efforts of governments and the watchdog role of a number of national level interest groups (Stigliani et al. 1993; Bernauer and Moser 1996; Dieperink 2000). The nesting aspect is also evident with regard to the European multi-level governance system of which the ICPR is a part. Political cooperation at the European level facilitated the successful organization among the riparian nations within the ICPR in at least three regards. First, the European Economic Community (EEC) and the subsequent European Community (EC) helped overcome World War II animosities and created binding economic dependency between nations like France and Germany. Second, the EU regime was explicitly designed as a multi-level governance system, and this permitted embracing and encouraging regional initiatives like the ICPR (Frijters and Leentvaar 2003; Mostert 2009). Third, the EU environmental legislation, of which water law has always been a frontrunner (e.g. Urban Wastewater Directive, 30/05/1991; Nitrate Directive, 91/676/EEC; Dangerous Substances Directive, 76/464/EEC; the Water Framework Directive, 2000/60/EC, etc.) is binding on EU member states. As further explained in a section below, those rules were actively appealed by interest groups at the national level to enforce ICPR measures (Dieperink 2000; Disco 2007). 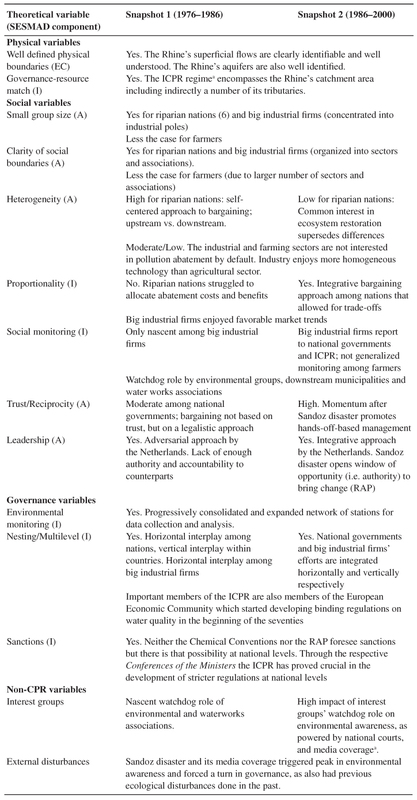 A series of actor characteristics emphasized by CPR theory help to explain the ability of the groups of riparian nations and industrial polluters to self-organize. Those characteristics include the existence of clear social boundaries, the size of the groups, and the homogeneity of interests. According to CPR theory, clear social boundaries help to internalize positive and negative externalities at low cost, ensuring that those who bear the costs of cooperating are the ones who receive the benefits (Ostrom et al. 1994; Cox et al. 2010). Furthermore, small group size can be associated with reduced costs of coming to agreements and monitoring (Olson 1965; Ostrom et al. 1994; Poteete and Ostrom 2004; Poteete et al. 2010). In pollution cases, clear social boundaries and small group size can facilitate the assignment of pollution abatement responsibilities across different actor groups as well as the emergence and development of cooperation among agents within each group. This seems to have been the case of the group of riparian nations and the industry in the Rhine. Most of the Rhine basin is contained within the Netherlands, France, Germany, Switzerland and Luxemburg. These countries and the European Commission (EC) are represented in the ICPR. 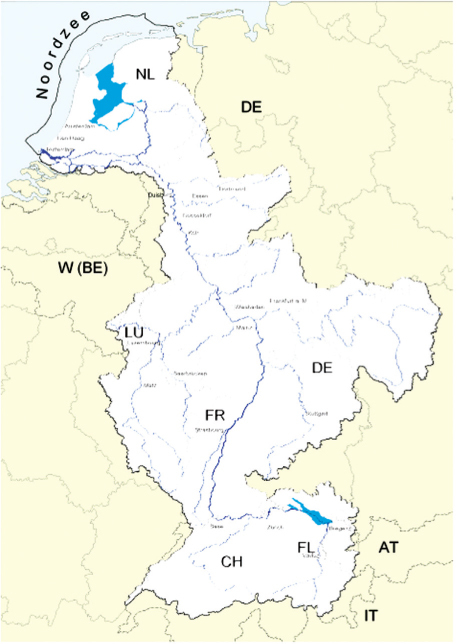 Very small portions of the watershed also fall within with Austria, Lichtenstein, Italy, and the Wallonie region of Belgium. These countries are consulted but do not have veto power in the ICPR. Running the ICPR with 5 rather than 9 veto members should have reduced bargaining costs significantly. Moreover, the political costs of exiting ICPR agreements have increased over time with the rise of public environmental awareness (Dieperink 2000). Similarly, industry in the Rhine is clustered into only 6 industrial complexes5 (ICPR 2012e) and a relatively small number of sectors. Some of those sectors, like the chemical and the metal sectors, contain just a handful of big firms6 (Stigliani et al. 1993) that coordinate through federations at the national and European levels (Raadgever 2005). For example, this is evident in Germany, where “both the German Association of the Chemical Industry (VCI) and the Abwassertechnische Vereinigung (the professional association of German wastewater specialists) have been motors behind the massive investments in water and air protection undertaken by the chemical firms” (Verweij 2000, 1036).7 In contrast to the riparian nations and industry, the number of farmers is much higher and more spread out (ICPR 2012e). This makes cooperation for pollution control much more costly among farmers than among the industrial firms8. The dearth of references to pollution control efforts made by farmer associations within the literature is revealing in that regard. The difficulty the ICPR has experienced in monitoring fragmented agricultural emissions is also congruent with the argument (ICPR 2012e). Small group size does not necessarily guarantee cooperation. Rather, it is usually mediated by the heterogeneity of interests within the groups (Poteete and Ostrom 2004). When heterogeneity of interests is high the internal politics of reaching agreements may involve high transaction costs. Alternatively, homogeneity of interests facilitates common understanding, eases the formation of collective agreements and adds certainty about behavioral patterns and cooperation (Varughese and Ostrom 2001; Poteete and Ostrom 2004; Poteete et al. 2010). In the Rhine case, this factor helps to explain the cooperative turn of the nation states in the mid-1980s. In the 1970s and early 1980s national governments were concerned about protecting their economies from the costs of pollution and pollution abatement (Bernauer and Moser 1996; Verweij 1999, 2000; Dieperink 2000). There was clear asymmetry between the Netherlands, which bore the most pollution cost due to its downstream location, and the other nations, which potentially bore the most pollution abatement cost (Mostert 2009). The situation changed with the Sandoz disaster, which served to raise public awareness of, and thus the political costs of failing to address, the pollution problem. The chemical spill affected the entire basin from its head, and environmental groups used it to blame governments for their failure to control pollution, both in upstream and downstream countries. The increased homogeneity of interests (i.e. of political costs for governments) translated into the approval of the RAP and the creation of a more flexible approach to governance based on side-agreements and self-responsibility. By these means, the RAP aimed at promoting collaboration through the identification of common interests. The RAP’s new focus on ecosystem restoration, an activity from which upstream and downstream countries benefit more equally than with pollution control, is another piece of evidence in that regard (Verweij 1999, 2000; Mostert 2009). Understanding the institutional developments in the 1970s and the 1980s requires paying attention to the role of leaders, particularly the Dutch government. According to CPR theory, leaders can reduce the costs of agreement formation, as well as perform more general functions such as trust building, conflict management, knowledge diffusion, and mobilization for change (Ostrom 1992). In the Rhine case, the Dutch government played a leadership role at different points in time with mixed results (Verweij 1999; Dieperink 2000). The Dutch government was one of the first governments to create regulations to control pollution at the national level as well as to raise the issue of water quality in the Rhine at the international level. The first steps towards the creation of the ICPR were the result of lobbying by the Dutch national and local governments, and Dutch waterworks associations (Bernauer and Moser 1996; Dieperink 2000; Disco 2007). However, the Dutch lacked authority to enforce agreements on other countries and their credibility was undermined by an adversarial approach to dealing with upstream polluters. With the Sandoz disaster, a window of opportunity for change opened and this was used by the Dutch minister of transport to bring to the table a more integrative model of governance that gave birth to the RAP. Despite its lack of strong authority or reputation as an impartial party, the Dutch were ultimately able to induce change (Verweij 1999; Dieperink 2000). Compliance with regulations is key to the performance of governance systems. We argue that the effective compliance with formal agreements by the riparian nations from the 1980s on is correlated with an increase in the proportionality of the distribution of costs and benefits as well as in the levels of trust among nations. Compliance in the case of industrial polluters can also be understood by considering proportionality of costs and benefits, as well as rule enforcement by national governments. According to CPR theory, the likelihood of cooperation increases when agents perceive that costs and benefits associated with their cooperative efforts are fair as compared to the costs and benefits of others (Agrawal 2001; Trawick 2001; Cox et al. 2010). In the same vein, the existence of trust in the reciprocal behavior of others has been shown to enhance cooperation (Ostrom 1998; Ostrom and Walker 2005). In the Rhine case, the heterogeneity of interests among the riparian nations in the 1970s translated into a zero-sum bargaining approach. Additionally, the excessive reliance on regulations to control emissions prescribed by the Chemicals Convention, prevented the consolidation of trust among the parties (Raadgever 2005).9 This was associated with suboptimal outcomes (Nollkaemper 1990). Point source pollution emissions had notably reduced during the 1970s but then stabilized in the 1980s above desirable levels (Verweij 2000). More importantly, the issue of non-point source pollution was ignored. The situation changed with the approval of the RAP. The new Plan increased the proportionality of costs and benefits among the nations by facilitating side-agreements and compensatory measures. Also, the Plan enhanced trust by eliminating procedural requirements such as technical implementation standards at the domestic level (Verweij 1999). All this contributed to a more pro-active and collaborative conduct by governmental agencies, the industry, and interest groups (Gurtner-Zimmermann 1998; Disco 2007), ultimately leading to an improvement in ecological outcomes (Mostert 2009). A series of side agreements between Dutch cities and interest groups, and upstream polluters in France and Germany, in the late 1980s/early 1990s, after more than a decade of confrontation, are paradigmatic of the collaborative turn. The pollution reduction efforts made by big chemical and metal industries right from the 1970s can be also understood from a cost-benefit approach, as those efforts were facilitated by a period of economic growth and increasing revenues, helping finance investments in new, more efficient technologies (Bernauer and Moser 1996). Further, some authors argue that a number of big chemical firms treated the challenge of developing new wastewater treatment technologies as an opportunity to capture a new market niche (MPR 2001). This was not the case of the farming sector. In the 1970s, the sector in many European countries was going through an important reconversion of its productive structures to accommodate to the growing European common market and global competition (Fennell 1997). This translated in a long-term effort to reallocate production efforts across countries and intensify productivity and has constituted the main mission of the European Common Agricultural Policy (CAP) until very recently. The costs of reconversion were large for some subsectors across Europe (Grant 1997). Thus, much of the mission of the CAP was to compensate via a program of production incentives and price support mechanisms. In this context it is reasonable to expect that the farming sector was not particularly concerned about the need to include in their calculus of costs and benefits a more rational use of fertilizers and pesticides. Rule enforcement, i.e. monitoring and sanctioning, has been emphasized in the CPR literature as one of the most important factors stimulating cooperation for its contribution to rule compliance (Gibson et al. 2005; Coleman and Steed 2009). The Chemicals Convention did not include any sanctioning mechanism at the international level (Nollkaemper 1996). However, regulations at the national level did and this was effectively used several times by interest groups to force upstream firms to comply with emission limits and/or to compensate downstream users for pollution externalities (Nollkaemper 1990). Additionally, the extensive political and legal activity by national governments within the ICPR in the 1970s was seen by the industrial firms as the prelude to stricter regulations in the Rhine. The interest in anticipating such regulations also motivated firms to reduce emissions (Bernauer and Moser 1996). Later on, the RAP did not add any sanctioning provisions to the governance system; however, it further strengthened monitoring by integrating the industrial sector within the environmental information systems. According to our results, a number of variables from CPR theory help to understand the progress made by the riparian nations with regard to pollution control during the 1970s and 1980s, as well as the pollution abatement efforts carried by a number of industries (see Table A1 in Appendix 1). Those factors include physical attributes such as the existence of clear hydrological boundaries of the watershed; governance factors such as the articulation of environmental monitoring and decision-making at different governance levels; and actor characteristics like small group size, the relatively concentrated location of some actor groups (i.e. riparian nations and the industrial sectors) and the leadership role played by the Netherlands. Although the Chemicals Convention was not initially fully implemented, it set the path for pollution abatement efforts by industrial polluters and the consequent reduction in the emissions of a number of point-source pollutants. The failure of the Chemical Convention to be fully implemented points to the relevance of a number of other CPR factors. These include insufficient trust and the presence of heterogeneities of interests among upstream and downstream nations, as well as the limited proportionality in the allocation of the costs and benefits of implementing the Convention. The collaborative turn of the riparian nations in the mid-1980s correlated with a change in the values of those variables and a new leadership role played by the Dutch government. Other CPR factors, such as the right of actors to self-organize and participate in collective decisions, the productivity of the resource system, communication among actors or resource dependence were found to be irrelevant or in need of qualification. First, according to CPR theory, allowing resource users to self-organize contributes to cooperation and the development of institutional regimes that are adapted to different contexts (Ostrom 1990). The literature on self-regulation by industry may provide valuable insights regarding the positive role that CPR theories assigns to actors’ right to self-organize. In this literature, the particular role of sanctions is debated (King and Lenox 2000). Some argue that penalties and sanctions are required to prevent firms from free riding on the efforts of others (e.g. Greif 1997), while others hold that the need for such sanctions is overstated because the firm behavior can be controlled through the transference of norms and the diffusion of best practices (e.g. Nash and Ehrenfeld 1997). Our results do not provide conclusive answers to the questions posed in this debate. In the Rhine, both the industrial and agricultural sectors have actively used their right to self-organize into associations for different purposes, but only the latter translated their right to self-organize into significant efforts to control pollution. Autonomy may be necessary, but is not necessarily sufficient for successful outcomes. Second, CPR theory stresses the importance of the collective choice: resource users must be able to participate in decisions that affect their use of the resource. This factor is also believed to contribute to cooperation (Ostrom 1990) but its relevance for the Rhine case is inconclusive, as neither the industrial or agricultural sectors are directly represented in the decision-making processes within the ICPR on a regular basis (ICPR 2012c). The notion of collective choice was developed with regard to local contexts, where opportunities for collective choice are limited to direct participation and relatively simple structures of representation. In large, international contexts like the Rhine’s there are many other possibilities to influence decision-making, including lobbying national and international decision-making bodies and using the mass media. Further research should develop new operational definitions of the idea of collective choice for the study of large scale governance. Third, CPR theory posits that resource users are more eager to cooperate and invest in the conservation of a resource if the resource has at least certain level of productivity (Poteete et al. 2010). In the Rhine case, however, the riparian nations took collective measures to control pollution only after the 1960s, more than a decade after salmon stocks and the biological productivity of the river had reached their poorest state (i.e. zero productivity). That said, we cannot rule out the possibility that without productivity being an issue, measures to control pollution would have been taken even later. Fourth, CPR theory argues that communication is a crucial for cooperation (Ostrom et al. 1994). While the ICPR was created upon a schedule of regular meetings among the riparian nation’s representatives (ICPR 2012a) such communication did not prevent the stalemate in the implementation of the Chemical’s Convention in the 1970s. Thus, communication may be a prerequisite for cooperation but it is not sufficient, particularly in large-scale contexts like the Rhine’s, where the impact of communication on commitment for collective action is frequently mediated by the need to accommodate diversity of interests. Fifth, there is the factor of dependence. According to CPR scholarship, unless individuals depend on an environmental commons they will not have incentives to sustain it (Ostrom 1992; Ostrom et al. 1994). The Rhine case illustrates the importance of economic dependence both to understand cooperation and the lack of it. The pro-collaboration role played by the Dutch government is justified if we consider the exposure of the Netherlands to the decreased water quality of the Rhine, while the resistance of riparian nations like Germany or France to pollution control mechanisms in the 1970s can be understood with regard to the dependence of their economies on polluting activities. Additionally, the case illustrates that cultural salience may play an important role too. The focus on salmon restoration in the mid-1980s cannot be understood with regard to economic incentives, for salmon stocks (and many other fish species) had been extinct since the 1940s. However, salmon held important cultural salience as a result of a growing environmental movement. This movement emphasized the intrinsic value of the Rhine’s ecosystem for more than a decade and ultimately constituted the basis for the political crisis triggered by the Sandoz disaster (Mostert 2009). First, environmental groups, waterworks associations and local governments played an important role as watchdog and environmental-awareness promoters from the 1970s onwards. They benefited from the increasing availability of environmental information about pollution in the watershed and the coercive power of regulations at the national level (Nollkaemper 1990; Bernauer and Moser 1996; Mostert 2009). The pressure exerted by those actors over upstream polluters during the 1970s (see timeline for examples) emerged as a reaction to the limited progress that national governments had made since the Berne Convention and contributed to increase the effectiveness of the emerging governance system (Dieperink 2000). Second, the Sandoz disaster and its media coverage prompted a peak in awareness about the pollution status of the Rhine, and this opened a window of opportunity for reform. As a matter of fact, that was not the first time that a disturbance had triggered a governance change in the watershed. An accident similar to the Sandoz disaster in the 1960s11 led to the emergence of new interest groups for the protection of the Rhine and negotiations that led to the Berne agreements (Bernauer and Moser 1996; Dieperink 2000; Disco 2007). The importance of disturbances is not completely alien to CPR theory. An increasing number of scholars are paying attention to the influence of different types of threats on sustainable management and cooperation (Janssen and Anderies 2007; Schoon and Cox 2011). The Rhine case confirms the relevance of that research agenda. In this paper, we have aimed to understand the sustainable management of pollution problems in a large, trans-boundary watershed like the Rhine. In that process, we have also tested the extent to which the effects of variables identified by CPR theory to explain sustainable management at local levels are applicable to problems other than conventional appropriation or provision problems. According to our results, CPR theory can help to understand the relative success of the Rhine’s governance system vis-à-vis pollution management. The theory helps to understand the sustained collaboration among the riparian nations for more than four decades and the gap in performance between point-source and non-point source pollution abatement. The analysis also illustrates the need to qualify the role of certain key variables proposed by CPR theory, such as leadership and resource dependence, as well as to consider new variables such as the role of interest groups and the occurrence of disturbances. The main goal of this paper was to test whether CPR theory applies in the context of large-scale water pollution problems, and address an important critique about the theory’s limited generalizability beyond local CPR management contexts. For that purpose, we systematically coded and synthesized insights from studies of the Rhine case about governance, actor and pollutant attributes and their interactions. The focus on interactions allowed us to assess the nexus between governance and environmental outcomes over time and across types of pollutants and polluters. Although there are numerous accounts of variation in performance of the ICPR, explanations of it are rather fragmented and focused either on the over time or the point vs. non-point source dimensions. The use of CPR theory and the focus on interactions allowed us to provide a consistent explanation of the relative success of the Rhine case across both dimensions. Also, our use of the SESMAD illustrates the potential of relational databases to develop single case studies in addition to the more common development of comparative or large-N analyses (Young and Zürn 2006; Pahl-Wostl et al. 2012). Finally the strong conceptual and theoretical foundations of CPR theory make the theory a very good starting point to explain governance and environmental outcomes at large scales, and contribute to theory building within the international environmental regimes and river basin management fields. We hope with this study to inspire further qualifications and extensions of the theory as well as connections to other theories within the abovementioned fields. Our review of the major publications on Rhine governance shows that there is a connection between explanatory variables proposed by CPR theory, the design and development of the ICPR governance system, and the improvement of environmental outcomes in the Rhine. The notable reduction in the concentration of point source pollutants from the 1970s until the beginning of the 1980s can be linked to the effective monitoring system coordinated by the ICPR (Nollkaemper 1990; Mostert 2009), the social and judicial pressure exerted by interest groups (Bernauer and Moser 1996), the favorable economic context the market incentives to develop pollution efficient technologies and the self-organization capacity of the chemical industry (Verweij 2000). By the mid-1980s the chemical corporations in the Rhine basin had reduced their discharges of toxics to a far greater degree than required by the legal norms. This contrasts with the limited progress made within the ICPR to implement the Chemicals Convention (Nollkaemper 1990; Verweij 2000), but is congruent with other aspects of the broader governance system. In addition to the abovementioned monitoring capacity, the ICPR resulted in extensive political and legal activity by national governments, which was seen by the industrial firms as the prelude to stricter regulations in the Rhine. The interest in anticipating such regulations motivated the sector to reduce emissions. Despite the progress made with regard to point source pollution, by the beginning of the 1980s, it became increasingly clear that the efforts proposed to reach a significant improvement of the quality of the Rhine had become deadlocked (Nollkaemper 1990) or were not as successful as expected compared to similar cases (Verweij 2000). With the Sandoz disaster, the RAP and the collaborative turn, point-source pollution control received a new stimulus (Gurtner-Zimmermann 1998). More importantly, non-point source pollution became a priority in the policy agenda. Until then, non-point source pollution had been largely ignored by the ICPR and riparian nations. Also, the agricultural sector, the main source of non-point source pollutants like phosphorous and nitrogen, had not enjoyed the conditions that had favored voluntary pollution control efforts in the chemical industry. After the RAP, nitrogen concentrations started decreasing at a noticeable rate, arguably due to greater efforts to reduce agricultural emissions (Farmer and Braun 2002; Froehlich-Schmitt 2003; Prasuhn and Sieber 2005). Our ability to reconstruct the entire chain of causality between governance and outcomes is limited for two reasons: data availability and the absence of a clear theory on the relationship between cooperation and other sustainability factors. First, our reliance on within case comparisons and process tracing was constrained by the data we used. The Rhine is one single case, i.e. one among many examples of large scale resource governance. This makes our findings generalizable only to similar cases. Similarly, data collection relied on databases and secondary sources. Although the sources were numerous, our ability to address alternative hypotheses would have been higher if based on our own field data. This is particularly evident with regard to our inability to draw clear findings about the role of the agricultural sector in the Rhine case. Differences in term of self-organization capacity, economic incentives, and visibility to watchdog groups and the judicial system can explain why the agricultural sector did not develop the same pollution control efforts during the 1970s; however, the connection between the collaborative governance turn and the reduction in nitrogen and phosphorous emissions from diffuse sources after the mid-1980s on the one hand, and potential changes in some of the above cooperation factors on the other is less clear. Many authors point to the (slight but still significant) decrease of non-point source (i.e. agricultural) pollution and its connection to the mid-1980s governance turn (Stigliani et al. 1993; de Wit et al. 2002; Farmer and Braun 2002; Mcleod and Haygarth 2003); however, we lack data that would enable us to evaluate the role of the agricultural sector in that process. Second, factors other than those pointed by CPR theory (see some of those mentioned above such as public awareness, market conditions, or changes in technology) can explain cooperation and improved environmental outcomes. CPR theory does not say much about the relationship between cooperation and other sustainability factors. Although exploring that relationship was not the main goal of our case study, we provided some insights about it. Future research might look more systematically into the mediating and/or moderating role of sustainability factors in the relationship between cooperation and sustainability. The lack of a clear understanding of the link between cooperation and other sustainability factors is connected to a broader issue of indiscriminate pluralism in CPR theory. The theory points to a good number of variables that can contribute to cooperation and sustainable management of local natural resources; however, the theory does not clearly differentiate how much and when those factors do make a difference (Agrawal 2001). In this study we aimed at coping with that issue through the combination of theory testing, within-case comparisons and process-tracing. However, these techniques have limitations. The test of theoretical expectations can be particularly effective for falsifying theory but has limited ability to confirm support of a theory; the validity of within-case comparisons can be questioned by the lack of equivalent counterfactuals; and the use of process-tracing risks confounding sequential occurrence with causality. We combined the three techniques to minimize those issues in a rather unsystematic way due to data availability constraints. Further efforts might be devoted to systematize the combination of those and other techniques. As a final note, it is worth highlighting the contribution of this case study to the improvement of the SESMAD structure and content. First, the focus on pollution problems posed the challenge of representing and coding the relationship between multiple environmental commons (e.g. pollutants like cadmium and natural resources like salmon), as mediated or not by a governance system. A focus on overexploitation problems like in the case of fisheries or forest use might not necessarily have required such a development. Second, the focus on the watershed sector, pollution problems and the specific case of the Rhine inspired the inclusion of new variables such as upstream vs. downstream asymmetry and external disturbances, and the refinement of others, including the distinction of enforcement activities at different governance levels. 1From this point of view, the management challenge is restoring the productivity of the resource (i.e. improving the quality of water or increasing fish stocks in the Rhine), which is in essence a provision problem. 2The lack of a predetermined sample of sources and the fact that there was only one case to be coded made the collaborative coding strategy more appropriate than an independent coding strategy where one individual carries the coding and then reliability is checked against the independent coding of other individuals (Krippendorff 2004). 3This is also a concern in theories that have been built mostly on small-N studies, like CPR theory (Agrawal 2001). 4The difference between emission control efforts of point and non-point source polluters is also visible within the group of heavy metals and the group of nutrients. During the 1980s and 1990s, industry decreased its phosphorous and nitrogen emissions proportionally more than the agricultural sector (Behrendt et al. 2002; de Wit et al. 2002; Farmer and Braun 2002), and the agricultural sector decreased its heavy metal emissions proportionally less than the industry (Stigliani et al. 1993). 5This includes the clusters of Basel/Mulhouse/Freiburg, Strasbourg, Rhine-Neckar, Frankfurt-Rhine-Main, Metropolitan region Rhine-Ruhr, and Rotterdam-Europoort. 6The chemical sector includes 6 major firms. Also, in the 1970s, only two thermal zinc smelters located on the river were the source of around 50% of all aqueous emissions (Stigliani et al. 1993). 7The importance of the activities of these professional associations for the cleanup of the Rhine becomes clear when one considers that Germany’s largest chemical firms are located on the Rhine waterway. 8To be clear, the agricultural sector in the Rhine area is well organized (Raadgever 2005), but not for pollution abatement purposes. 9It is important to recall at this point that, until 1987, the governments of the ICPR members fought intensively over details of this governance regime (culminating in the Dutch ambassador’s recall from Paris in 1979). As a consequence of these struggles, the 1976 Salt and Chemical Conventions were barely implemented (Verweij 2000). 10By referring to these factors as not included in CPR theory we do not mean that the factors cannot affect CPR variables. As mentioned in this and the previous section, interest groups did play a crucial role in monitoring and sanctioning industrial polluters. Similarly, the Sandoz disaster strengthened the leadership role played by Dutch government and its effective promotion of the RAP. 11In June 1969, an accidental spill of the insecticide Endosulfan by Hoechst Chemicals caused a massive fish kill in the Main, one of the most important tributaries of the Rhine. Bernauer, T. 2002. Explaining Success and Failure in International River Management. Aquatic Sciences – Research Across Boundaries 64(1):1–19. doi: 10.1007/s00027-002-8050-4. Bernauer, T. and P. Moser. 1996. Reducing Pollution of the River Rhine: The Influence of International Cooperation. The Journal of Environment & Development 5(4):389–415. doi: 10.1177/107049659600500402. De Groot, S. J. 1992. Decline and Fall of the Salmon Fisheries in the Netherlands: is Restocking the Rhine a reality? Aquaculture Research 23(2):253–264. De Groot, S. J. 2002. A Review of the Past and Present Status of Anadromous Fish Species in the Netherlands: is Restocking the Rhine Feasible? Hydrobiologia 478(1–3). de Wit, M., H. Behrendt, G. Bendoricchio, W. Bleuten, and P. v Gaans. 2002. The Contribution of Agriculture to Nutrient Pollution in Three European Rivers, with Reference to the European Nitrates Directive. European Water Association. Dieperink, C. 1998. From Open Sewer to Salmon Run: Lessons from the Rhine Water Quality Regime. Water Policy 1(5):471–485. doi: 10.1016/s1366-7017(99)00010-0. Dieperink, C. 2000. Successes in the International Cooperation in the Rhine Catchment Area. Physics and Chemistry of the Earth, Part B: Hydrology, Oceans and Atmosphere 25(3):341–347. doi: 10.1016/s1464-1909(00)00024-1. Disco, C. 2007. Accepting Father Rhine? Technological Fixes, Vigilance, and Transnational Lobbies as ‘European’ Strategies of Dutch Municipal Water Supplies 1900–1975. Environment and History 13(4):381–411. doi: 10.3197/096734007x243140. Farmer, A. and M. Braun. 2002. Fifty Years of the Rhine Commission: A Success Story in Nutrient Reduction. CEEP, SCOPE Newsletter. Frijters, I. D. and J. Leentvaar. 2003. Rhine Case Study. In Technical Documents in Hydrology: UNESCO, IHP, WWAP. IHP-V.
Froehlich-Schmitt, B. 2003. Upstream Outcome of the Rhine Action Programme. Koblenz: International Commission for the Protection of the Rhine (ICPR). Glaumann, K. and K. Kim. 2012. Transboundary Water Management: Who Does What, Where? In Transboundary Water Management. Stockholm: Swedish Water House. Gurtner-Zimmermann, A. 1998. The Effectiveness of the Rhine Action Program. International Environmental Affairs 10(4):241–267. Hartgers, E. M. and A. D. BUIJSE. 2002. The Role of Lake IJsselmeer, a Closed-off Estuary of the River Rhine, in Rehabilitation of Salmonid Populations. Fisheries Management and Ecology 9(3):127–138. Huisman, P., J. de Jong, and K. Wieriks. 2000. Transboundary Cooperation in Shared River Basins: Experiences from the Rhine, Meuse and North Sea. Water Policy 2(1–2):83–97. doi: 10.1016/s1366-7017(99)00023-9. Langaas, S., ed. 2002. Environmental Information in Transboundary River Basin Policy-Making and Management: Selected European Case Studies Working Paper: MANTRA East. Lankford, B. H. N. 2010. The Cathedral and the Bazaar: Monocentric and Polycentric River Basin Management. Water Alternatives 3(1):82–101. Lindemann, S. 2006. Water Regime Formation in Europe: A Research Framework with Lessons from the Rhine and Elbe River Basins. Berlin: Environmental Policy Research Centre, Freie Universitaet Berlin. Mcleod, C. and P. Haygarth. 2003. A Review of the Significance of Non-point Source Agricultural Phosphorus to Surface Water. SCOPE Newsletter 51. Mostert, E. 2009. International Co-operation on Rhine Water Quality 1945–2008: An Example to Follow? Physics and Chemistry of the Earth, Parts A/B/C 34(3):142–149. doi: 10.1016/j.pce.2008.06.007. MPR. 2001. Cleaning Up the Rhine. Max Planck Research 1. Nienhuis, P. H., A. D. Buijse, R. S. E. W. Leuven, A. J. M. Smits, R. J. W. de Nooij, and E. M. Samborska. 2002. Ecological Rehabilitation of the Lowland Basin of the River Rhine. Hydrobiologia 478(1–3):53–72. Nollkaemper, A. 1990. The Rhine Action Programme: A Turning-Point in the Protection of the North Sea. Int’l J. Estuarine & Coastal 5. Nollkaemper, A. 1996. The River Rhine: from Equal Apportionment to Ecosystem Protection. Review of European Community & International Environmental Law 5(2):152–160. doi: 10.1111/j.1467-9388.1996.tb00264.x. Prasuhn, V. and U. Sieber. 2005. Changes in Diffuse Phosphorus and Nitrogen Inputs into Surface Waters in the Rhine Watershed in Switzerland. Aquatic Sciences – Research Across Boundaries 67(3):363–371. doi: 10.1007/s00027-005-0774-5. Raadgever, G. T. 2005. Transboundary River Basin Management Regimes: The Rhine Basin Case Study. In New Approaches to Adaptive Water Management under Uncertainty. RBA Centre, Delft University of Technology. Ruchay, D. 1995. Living with Water: Rhine River Basin Management. Water Science and Technology 31(8):27–32. doi: 10.1016/0273-1223(95)00353-o. Stigliani, W. M., P. R. Jaffe, and S. Anderberg. 1993. Heavy Metal Pollution in the Rhine Basin. Environmental Science & Technology 27(5):786–793. doi: 10.1021/es00042a001. Uehlinger, U., K. M. Wantzen, R. S. E. W. Leuven, and H. Arndt. 2009. Chapter 6 – The Rhine River Basin. In Rivers of Europe, 199–245. London: Academic Press. Verweij, M. 1999. A Watershed on the Rhine: Changing Approaches to International Environmental Cooperation. GeoJournal 47(3):453–461. doi: 10.1023/a:1006966223915. Verweij, M. 2000. Transboundary Environmental Problems and Cultural Theory: the Protection of the Rhine and the Great Lakes. Houndmills, Basingstoke, Hampshire, New York: Palgrave. Wieriks, K. and A. Schulte-Wülwer-Leidig. 2009. Integrated Water Management for the Rhine River Basin, from Pollution Prevention to Ecosystem Improvement. Natural Resources Forum 21(2):147–156. We gratefully acknowledge the contributions of the entire SESMAD team to this paper, and particularly to Michael Cox, who both led the associated project, and offered detailed and very helpful comments on this manuscript. FDF’s work on this project was supported by Dartmouth College’s Environmental Studies Program and Texas A&M University’s Department of Ecosystem Science and Management. SVT received support from the Workshop in Political Theory and Policy Analysis and the Division of Resource Economics at Humboldt University. Agrawal, A (2001). Common Property Institutions and Sustainable Governance of Resources. World Development 29(10): 164–1672. Amblard, L , . The Potential of Collective Action for the Control of Nonpoint Source Pollution in European Rural Areas. Paper Read at Design and Dynamics of Institutions for Collective Action Conference, November–December 1, 2012, at Utrecht. 2012. Anderies, J.M, Janssen, M and Ostrom, E (2004). A framework to analyze the robustness of social-ecological systems from an institutional perspective. Ecology and Society no. 9: 1–18. Behrendt, H, Kornmilch, M, Opitz, D, Schmoll, O and Scholz, G (2002). Estimation of the nutrient inputs into river systems–experiences from German rivers. Regional Environmental Change 3(1–3): 107–117. Blomquist, W, Schlager, E and Heikkila, T , . Common Waters, Diverging Streams: Linking Institutions and Water Management in Arizona, California, and Colorado. Washington, DC: Resources for the Future. 2004. Blomquist, W, Dinar, A and Kemper, K , . In Policy Research Working Paper Series. Washington DC: The World Bank. 2005. Comparison of Institutional Arrangements for River Basin Management in Eight Basins. Coleman, E. A and Steed, B. C (2009). Monitoring and Sanctioning in the Commons: An Application to Forestry. Ecological Economics 6(7): 2106–2113. Cox, M (2014). Understanding Large Social-Ecological Systems: Introducing the SESMAD Project. International Journal of the Commons 8(2): 265–276. De Groot, S. J (1992). “Decline and fall of the salmon fisheries in the Netherlands: is restocking the Rhine a reality?”. Aquaculture Research 23(2): 253–264. De Groot, S. J , . Ecological Restoration of Aquatic and Semi-Aquatic Ecosystems in the Netherlands (NW Europe). Springer, 2002. A review of the past and present status of anadromous fish species in the Netherlands: is restocking the Rhine feasible? ; p. 205.-218. Farmer, A and Braun, M (2002). Fifty years of the Rhine commission: A Success story in nutrient reduction. SCOPE Newsletter (47): 1–17. Fennell, R , . The Common Agricultural Policy: Continuity and Change. Oxford: Oxford University Press. 1997. Frijters, I. D and Leentvaar, J , . Rhine Case Study. In Technical Documents in Hydrology: UNESCO, IHP, WWAP. IHP-V. 2003. Froehlich-Schmitt, B , . Upstream Outcome of the Rhine Action Programme. Koblenz: International Commission for the Protection of the Rhine (ICPR). 2003. George, A. L and Bennett, A , . Case Studies and Theory Development in the Social Sciences, BCSIA Studies in International Security. Cambridge, Mass: MIT Press. 2005. Gibson, C. C, Williams, J. T and Ostrom, E (2005). Local Enforcement and Better Forests. World Development 33(2): 27–284. Glaser, B. G and Strauss, A. L , . The Discovery of Grounded Theory: Strategies for Qualitative Research. N.J.: New Brunswick AldineTransaction. 1999. Grant, W , . The Common Agricultural Policy. Basingstoke: Macmillan Press Ltd. 1997. Greif, A , ; Micro Theory and Recent Development in the Study of Economic Institutions Through Economic History. In: Kreps, D and Wallis, K eds. , editors. Advances in Economic Theory and Econometrics. Cambridge England: Cambridge University Press, 1997. p. 79.-113. Gurtner-Zimmermann, A (1998). The Effectiveness of the Rhine Action Program. International Environmental Affairs 10(4): 241–267. ICPR. International Commission for the Protection of the Rhine: Salmon 2000. Koblenz: ICPR. 1994. IKSR. Internationale Kommission zum Schutz des Rheines Aktionsprogramm Rhein. Straßburg: IKSR. 1987. Janssen, M and Anderies, J. M (2007). Robustness Trade-offs in Social-Ecological Systems. International Journal of the Commons 1(1): 43–66. Keohane, R. O and Ostrom, E eds. , editors. Local Commons and Global Interdependence. London: SAGE. 1995. Kerr, J (2007). Watershed Management: Lessons from Common Property Theory. International Journal of the Commons 1(1): 89–110. Krippendorff, K.H ed. , editor. Content Analysis: An Introduction to Its Methodology. Thousand Oaks, CA: SAGE. 2004. Lo, C. W.-H and Tang, S.-Y (1994). Institutional Contexts of Environmental Management: Water Pollution Control in Guangzhou, China. Public Administration and Development 14(1): 53–53. Mcleod, C and Haygarth, P (2003). A Review of the Significance of Non-Point Source Agricultural Phosphorus to Surface Water. SCOPE Newsletter 51: 1–10. MPR. Cleaning Up the Rhine. Max Planck Research 1: 55–57. Nash, J and Ehrenfeld, J (1997). Codes of Environmental Management Practice: Assessing Their Potential as a Tool for Change. Annual Review of Energy & the Environment 22(1): 487. Nienhuis, P. H, Buijse, A. D, Leuven, R. S. E. W, Smits, A. J. M, de Nooij, R. J. W and Samborska, E. M (2002). Ecological Rehabilitation of the Lowland Basin of the Rive Rhine. Hydrobiologia 478(1–3): 53–72. Nollkaemper, A (1990). The Rhine Action Programme: A Turning-Point in the Protection of the North Sea. Int’l J. Estuarine & Coastal 5: 123–138. Olson, M , . The Logic of Collective Action. Cambridge: Massachussetts: Harvard University Press. 1965. Ostrom, E , ; The Rudiments of a Theory of the Origins, Survival, and Performance of Common-Property Institutions. In: Bromley, D. W ed. , editor. Making the Commons Work: Theory Practice and Policy. CA: San Francisco: ICS Press, 1992. p. 293.-319. Ostrom, E (1998). A Behavioral Approach to the Rational Choice Theory of Collective Action: Presidential Address, American Political Science Association, 1997. The America Political Science Review 92(1): 1–22. Ostrom, E and Walker, J eds. , editors. Trust and Reciprocity: Interdisciplinary Lessons for Experimental Research. New York: Russell Sage Foundation. 2005. Ostrom, E, Gardner, R and Walker, J , . Rules, Games and Common Pool Resources. Michigan: Michigan University Press. 1994. Poteete, A. R and Ostrom, E (2004). Heterogeneity, Group Size and Collective Action: The Role of Institutions in Forest Management. Development and Change 35(3): 435–461. Poteete, A. R, Ostrom, E and Janssen, M , . Working Together. Princeton, NY: Princeton University Press. 2010. Raadgever, G. T , . Transboundary River Basin Management Regimes: The Rhine Basin Case Study. In New Approaches to Adaptive Water Management under Uncertainty. RBA Centre, Delft University of Technology. 2005. Uehlinger, U, Wantzen, K. M, Leuven, R. S. E. W and Arndt, H , ; Chapter 6 – The Rhine River Basin. In: Tockner, K, Uehlinger, U and Robinson, C. T eds. , editors. Rivers of Europe. London: Academic Press, 2009. p. 199.-245. Varughese, G and Ostrom, E (2001). The Contested Role of Heterogeneity in Collective Action: Some Evidence from Community Forestry in Nepal. World Development 29(5): 474–765. Verweij, M , . Transboundary Environmental Problems and Cultural Theory: the Protection of the Rhine and the Great Lakes. Houndmills, Basingstoke, Hampshire: New York: Palgrave. 2000. Wieriks, K and Schulte-Wülwer-Leidig, A (2009). Integrated Water Management for the Rhine River Basin, from Pollution Prevention to Eosystem Improvement. Natural Resources Forum 21(2): 147–156. Yetim, M (2002). Governing International Common Pool Resources: the Internationl Watercourses of the Middle East. Water Policy 4(4): 305–321. Map of the Rhine watershed. Structure of the Rhine SES during the two snapshots coded. The figure highlights the interaction between components. Changes in concentration levels of selected substances pre- and post-1986 (base year=1978). Source: elaborated from (ICPR 2012b).